joined by several fine writers in Western New York. This was an evening at Dog Ears Bookstore and Cafe during The 4th Friday Poetry Series where Jennifer Campbell was the featured reader. To purchase her outstanding writing, listen to audio, and to review her books, visit Jennifer Campbell, HERE. Please visit the bookstore, contact Fred about the series and check out Think Twice Radio below. Every St. Patrick's Day I put this out, a fine Celtic Rock Band, my dear brothers, all of them, in rare performance with The Ruffians. I recorded, engineered and edited/mixed this at one Irish Feis in South Buffalo managing so many boards I am shocked it turned out good. This includes the most mind-blowing version of "Black and Tans" with Danny from The Ruffians playing bones. Be safe, enjoy, and Slainte! 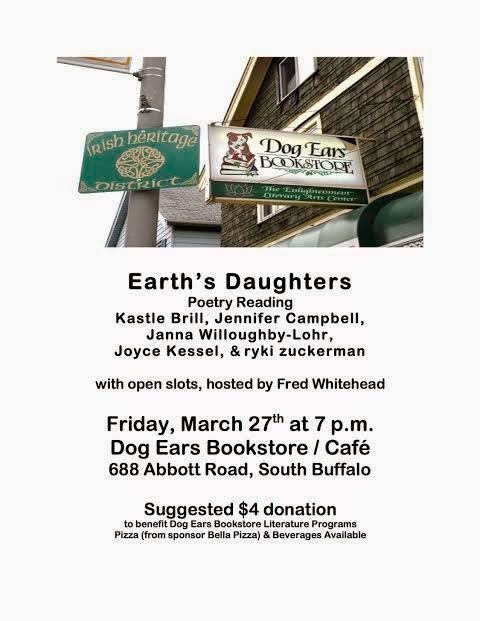 The editors of Earth's Daughters magazine (Kastle Brill, Jennifer Campbell, Joyce Kessel, Janna Willoughby-Lohr, and ryki zuckerman) will read from their work on Friday, March 27, at 7 pm in the Fourth Friday Reading Series at Dog Ears Bookstore, 688 Abbott Rd. South Buffalo. The series is hosted by Fred Whitehead. Admission is $4. Long time sponsor, Bella Pizza, will provide pizza and beverages will be available. Earth's Daughters is both name of the magazine, which has been publishing for 44 years, and the name of the collective, comprised of the editors, each of whom is an accomplished poet. 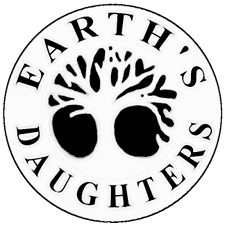 Earth's Daughters magazine is the longest continuously published feminist literary arts periodical in the US. Kastle Brill is a poet, memoirist, fiction writer, artist, and editor, who has two chapbooks: One Night Stands & Other Pieces of Time and The Head. She is also a retired environmental lawyer and an active and passionate tai chi teacher. Jennifer Campbell is a Professor of English at Erie County Community College/North. In addition to Earth’s Daughters, she co-edits Beyond Bones. Her first book of poetry, titled Driving Straight Through, was published by FootHills in 2008. 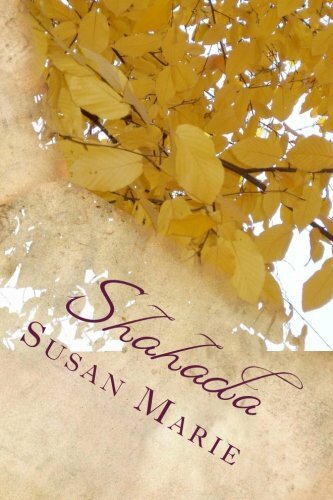 In 2013, Saddle Road Press published her collection, Supposed to Love. 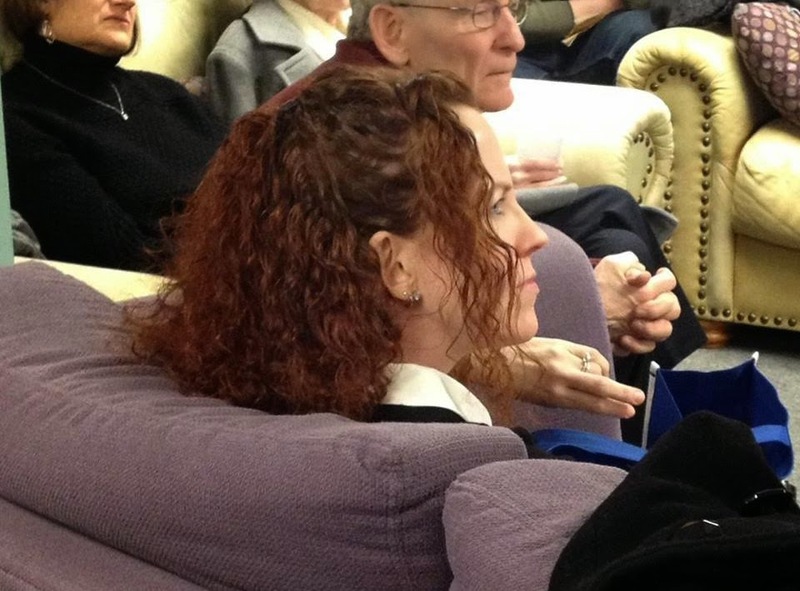 She is the co-curator of the Center for Inquiry Literary Cafe Series. 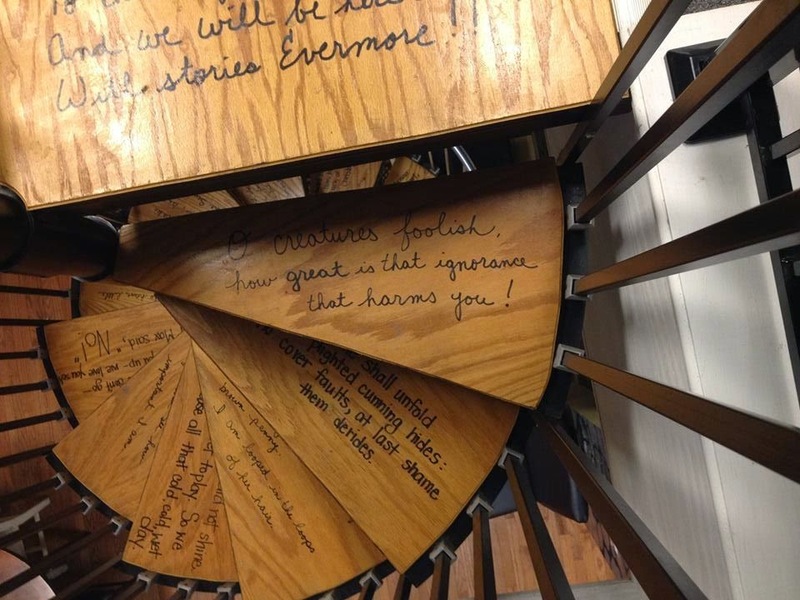 Joyce Kessel teaches literature, writing, and interdisciplinary courses at Villa Maria College. Her chapbook, Describing the Dark, was published in 2013 in the Forty-Three North Chapbook Series from Saddle Road Press. Classroom Quiche (Writer's Den) is due 2015. She has read at Hilbert College, ECC City Campus, and Empire State College at Appletree, and the CFI. Janna Willoughby-Lohr was awarded the "Best Spoken Word Artist" title in the Artvoice Best of Buffalo Awards 2010. Since graduating from Warren Wilson College, she has been performing poetry and music. She was a Grand Slam finalist in 2005-2008 for the Nickel City Poetry Slam, and a member of the 2006 Nickel City Slam team at the National Poetry Slam. She performs with her band, The BloodThirsty Vegans, "a lively mix of energetic hip-hop, rock, funk, Ska, and blues, topped off with socially-conscious, positive lyrics." She currently works as a graphic designer for Bodycandy.com. ryki zuckerman is a poet, editor, teacher, and artist who is the author of the full-length volume, Looking for Bora Bora (Saddle Road Press, 2013), and also the chapbook, body of the work (Textile Bridge Press). 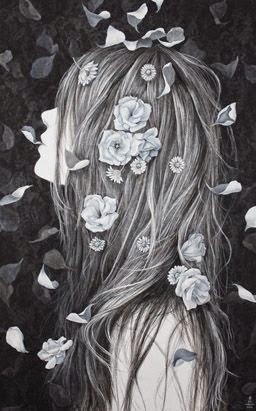 She has a forthcoming volume, The Nothing That Is, from Benevolent Bird Press (2015). 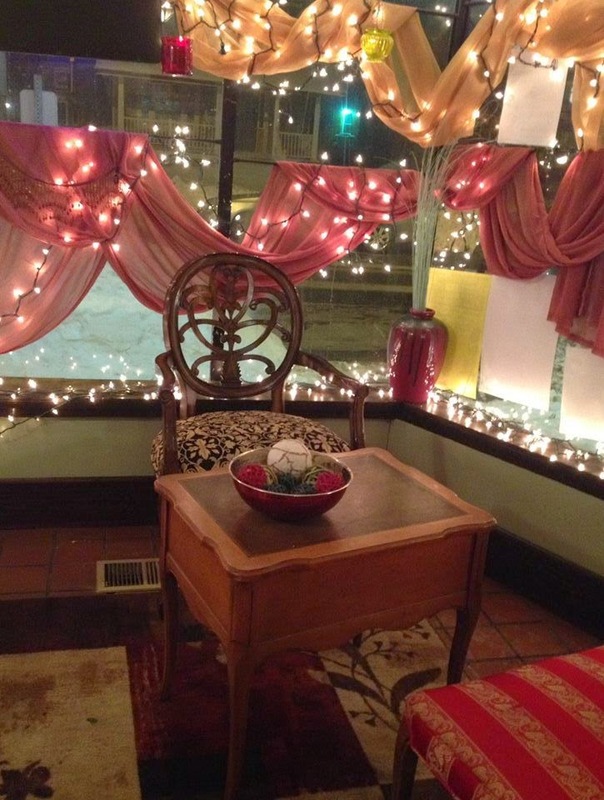 In 2009, ryki was a featured reader for the Poetry Collection of the University of Buffalo at the Butler Mansion. She created, curates, and hosts two series: the Wordflight at Red Doors Series and, for Earth's Daughters, the Gray Hair Series.